A soft chewy cookie made with pumpkin and coconut flour. 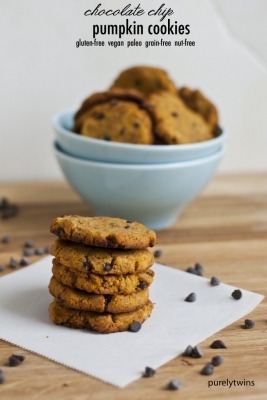 These cookies are free of gluten, grains, dairy, eggs, and nuts! Next add in your softened (liquid) coconut butter, coconut oil and pumpkin puree. End with adding in your water until the batter starts holding together. You want it to be on the thick side. Press cookies down if you want thin cookies. We got about 20-21 cookies, all depends on your size scooper.